Vumbura Plains (pronounced Voombera) Camp is a luxury camp situated to the north of Mombo, in a private concession bordering the Moremi Game Reserve in the extreme north of the Okavango Delta. The Vumbura Reserve offers both land and water activities in a park that has a wonderful variety of habitats and a great diversity of wildlife. The reserve offers an enormous traversing area of close on 130 000 acres. The main activity at Vumbura Plains is game viewing in wonderful and varied countryside. Open 4x4 Land Rovers allow close proximity to animals in the savannah and forested areas. The Vumbura area is possibly the only area in the Okavango where one can see Red Lechwe (an animal that inhabits the fringes of the waterways) and a Sable antelope (an animal that enjoys the dry countryside) on the same game drive. Add in Lion, Leopard, Elephant, cheetah and Buffalo along with all the plains animals and one has an excellent all round wildlife experience in a remote and private part of the Okavango. Birding too is great with large varieties and quantities. Walks, mokoros and boating give Vumbura's guests the opportunity to enjoy Africa from a different perspective. 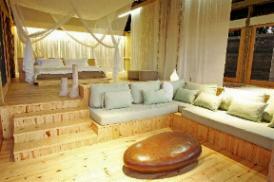 Vumbura Plains overlooks a vast, attractive floodplain and the rooms are built under the shade of cool and shady trees. Vumbura Plains consists of 2 x 14-bedded camps linked by raised boardwalks and each has its own dining, lounge and bar area although all 28 beds or parts thereof can be utilised for larger parties. All of the luxury rooms are raised off the ground on wooden platforms with walkways connecting them to the main living areas. Each room has a large, very comfortable bedroom, a lounge, a "sala" and en-suite facilities with a shower, a flush toilet and an outdoor shower under the stars. The main dining, lounge and pub area is also raised off the ground and tucked beneath a canopy of shady, indigenous trees with a wonderful vista across the floodplains. Each room has its own plunge pool. Vumbura Plains has both the wetland and savannah species of wildlife - Red Lechwe, Waterbuck, Hippos, Crocodiles, as well as Sable, Kudu, Wildebeest and Tsessebe, who roam the open plains. On game drives establishment often see more Sable than establishment do Impala. 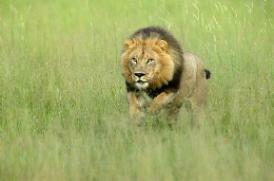 Herds of Buffalo and Elephant occur here, along with the predators - Lion, Leopard, Wild Dog and Cheetah. Guests who enjoy their birding will love the combination of all the Okavango water "specials" with acacia and dry woodland species.